From the very beginning of our rebuild after the fire, I knew I wanted a statement bathroom. The half bath on the main level is tiny and I’ve thought of nearly every possible option for making the tiny space shine. 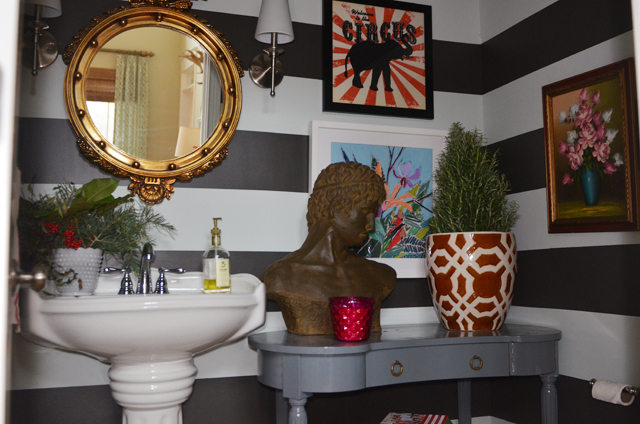 I started a ‘bathrooms’ board on Pinterest and had my eye on this striped bathroom for a year. I almost tackled this project before Better Homes and Gardens came in September but I had plenty to keep me busy then and was still hemming and hawing around about what exactly I wanted to do. 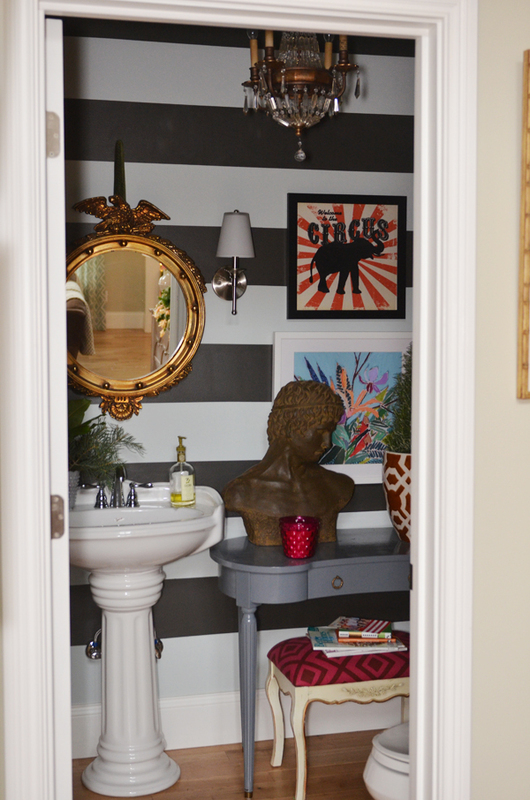 It all changed when Emily painted her foyer in the most gorgeous stripes ever. And since I adore her and everything about her, I knew it was time to dig out the rollers and brushes. Except then I saw this on Pinterest. And even though striped walls and I had been going steady for nearly a year, I almost ditched them for this brooding beauty from Lonny Magazine. After a little contemplation, I decided that I shouldn’t have to choose. Why can’t I have the best of both worlds? So, I painted the strip-ed walls (from here on out, we shall call him stri-ped, with emphasis on the ped, for reasons I can’t quite articulate) and then added the moody/broodiness with my main man, the bust of David, and some quirkily hung art. The bathroom is the love child of those three gorgeous rooms and now seriously competing with this room and this room for most favored room in the house status. I had my girls’ bedroom painted with stripes a few years back and loved it. I learned a few things from watching the process being done and I knew I could do it on the cheap. My trusty side kick, Nick, did all the hard work of taping it off. It took several hours and it’s not rocket science but it is most certainly tedious. I would advise all my ‘fly by the seat of your pants, ‘it looks pretty straight’, friends to let the OCDers have this one. I sat this one out. I know when I’m defeated. Some things I’m good at. Some things I’m not. Painstakingly taping all those straight lines is definitely not one of my spiritual gifts. Nick did great but even his tendency towards perfection was challenged. So, we got it pretty close to perfect and then the next day, we painted it in a couple of hours. I measured the wall before we started and it was 96 inches, perfectly divisible by 8. So we decided on 8 inch stripes. 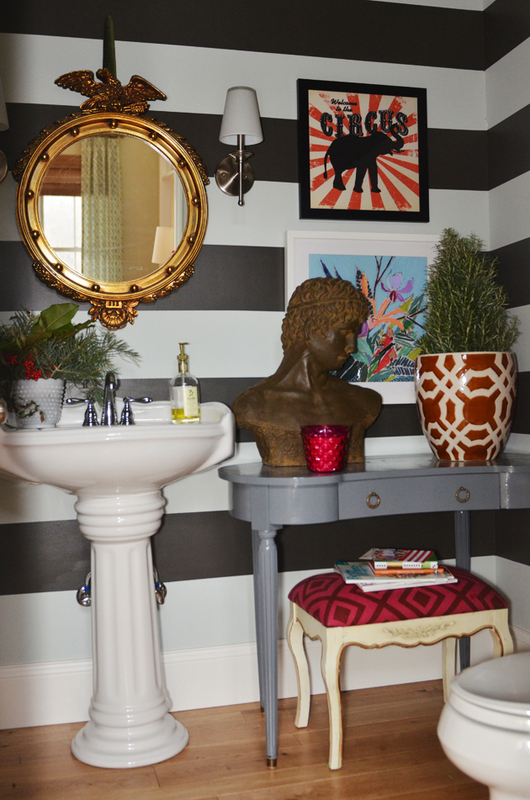 And I loved Emily’s foyer so much that we used the same color as she did for the charcoal stripes. The color is Urbane Bronze from Sherwin Williams. The walls were already painted Sea Salt by Sherwin Williams, so we started with that as a base. I would HIGHLY recommend painting the wall all over with one of the colors you want in your stripes. Let that dry for a day and then begin the taping extravaganza. 1. Take a credit card and smooth the tape down. DO NOT SKIP THIS STEP. It will keep the edges from ‘bleeding’ paint. 2. Dry brush the edges of the stripes before you actually paint them. And by that I mean, get just a little paint on the brush and do a thin, almost dry layer of paint to seal the edges of the tape. Then when you go back to actually paint the stripes, you won’t get any bleeding through the tape. We used Frog Tape and got great results. Our edges are perfection! The corners bled a little and Nick is at this very moment touching those up. I probably wouldn’t even have gone to the trouble but I love that he cares! We used a 6 inch roller to roll the stripes on, once we had dry brushed the edges. This is one of those projects with a huge pay-off and very low cost. It is most definitely fabulous in all it’s striped glory. I absolutely love it. I would love to go so bold in a small area of our home. Love all the art work you incorporated, too. Totally fabulous. I think that my stripes would definitely be a bit askew. My guest bedroom is screaming for some love. What do you think of a stri-ped bigger room? The ceiling color is sable, by sherwin williams from four years ago. The walls are a creamy-ish white and there is a mustard yellow canopy(ikea) bed. I really like the color of your stripes for my room too. Whatcha think? The duvet is currently white. Lol! You are crazy! 🙂 Thanks Mom, love you! I so wish I could live with you! 🙂 This bathroom totally makes a statement and I love it! The colors are perfect but the art work and David are the crowning glories I believe. Super job and it is awesome! i love it! looks fab. love the colors. 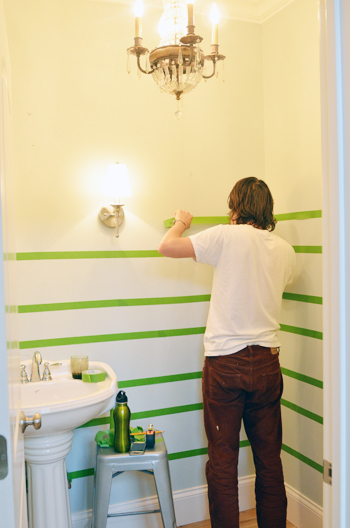 i know my cute husband would just curl up in a corner and cry if i asked him to tape off our guest bath. may i borrow nick? really, i am thinking a tour of bathrooms/bedrooms/mudrooms/hallways across the country. I agree. 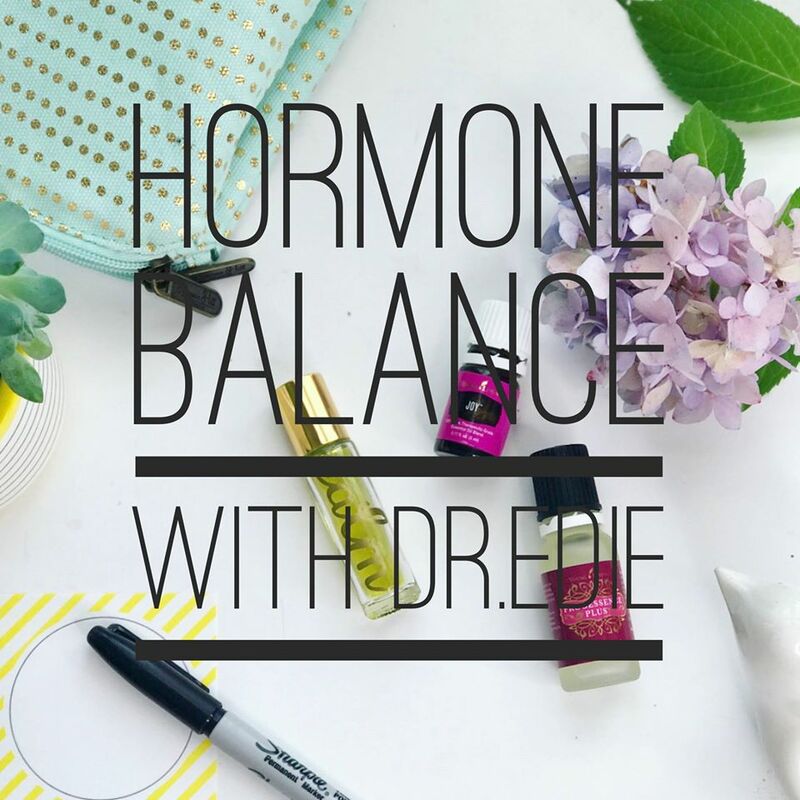 Stri-ped and definitely masculine. I would cry if I knew I had to paint perfect stripes. Cry a loud ugly cry. And I don’t think there’s anyone in my house, no whole family, that would help me out with it. So I’ll just admire your bee-you-tee-ful powder room. LOVE. You make me want more color in my life! I LOVE to say stri-PED! And I love your stri-PED walls! Thinking I might have to add this to my January list of to-do’s! Merry Christmas! I simply cant breathe thats so gorgeous. Really. Its not just the stripes. Its the whole of it. The sum of parts. Stunning. This post makes me happy for so many reasons 🙂 I love your stripes-obviously-and just the fact that you like my house makes me super happy. 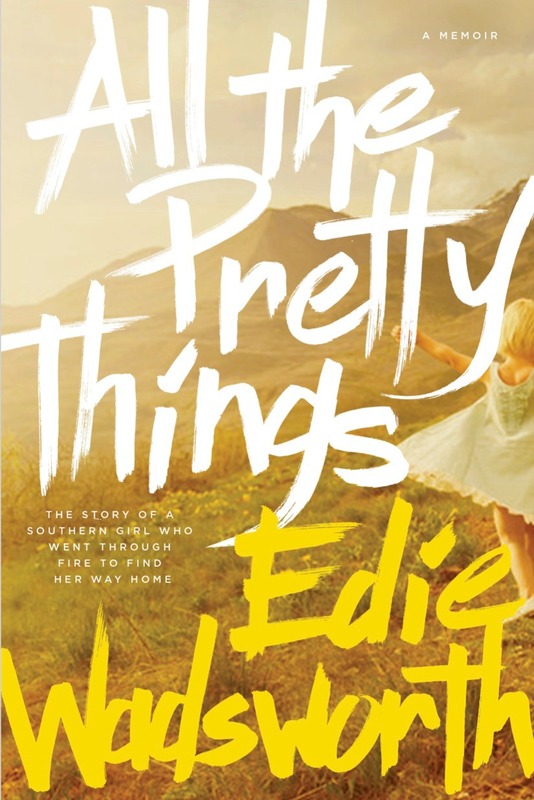 This is going to sound strange, but I swear when I was painting mine, I had the thought “This looks like something Edie would do.” I am not kidding! Maybe I study other bloggers’ homes too much??? Anywho, they turned out great and you have one patient sidekick. I can’t imagine how tedious the stripes must be to tape in a really small room. They were bad enough on a straightforward wall. LOOOOVE it! I keep putting off my little guest room bath over and over and this has me itching to work on it again. Beautiful!! That room is sharp. 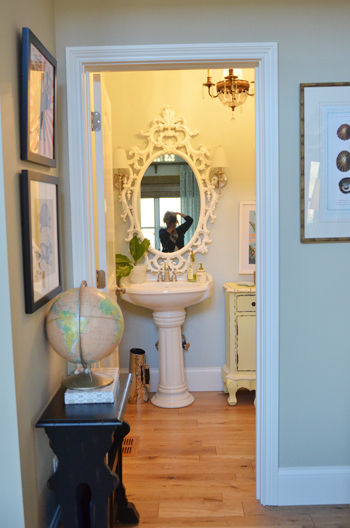 Not sure what I like more…the bathroom “after”…or the back story and how your inspiration all came together. The stripes are dramatic and classic, and the accessories really take it to another level. Color, pattern, texture, history, it’s got it all! 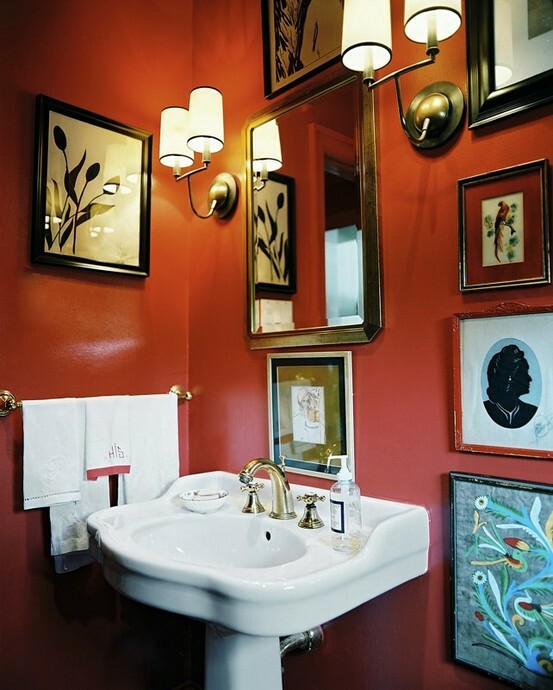 And one more thing…most of us that read this blog will not be looking at our (boooring) powder rooms the same near term. My mind is already ticking and looking forward to some free time to check out your pinterest bathroom board. simply gorgeous my dear. i’m so glad you went for it! the stripes are stunning 🙂 as well as the rest of your decor…..
Wow. The stripes and the graphic artwork are fantastic. Such a great job! Do you have people hanging out in your bathroom now? Cause I totally would! one day I’m totally gonna tee tee in that breathtaking bathroom. I’m putting that on my goal list for this coming year. Welcome to the “stripe walls” club:). Yes……you will love it here…..and probably think of excuses just to go sit in that gorgeous room!!! Gorgeous! 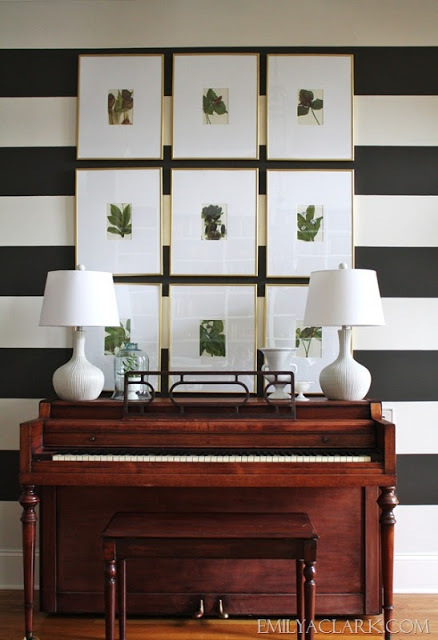 I adore the stripes, but I also love all the pictures and paintings you have hanging everywhere. Where are your favorite places to shop for those things. My walls seem pretty boring at the moment. They definitely need a wow factor. Now this gorgeous stripety room would make a severe case of IBS a delight! That room is SO YOU! and now i’m dating the idea of striped walls. it’s gorgeous…and i do mean g.o.r.g.e.o.u.s. 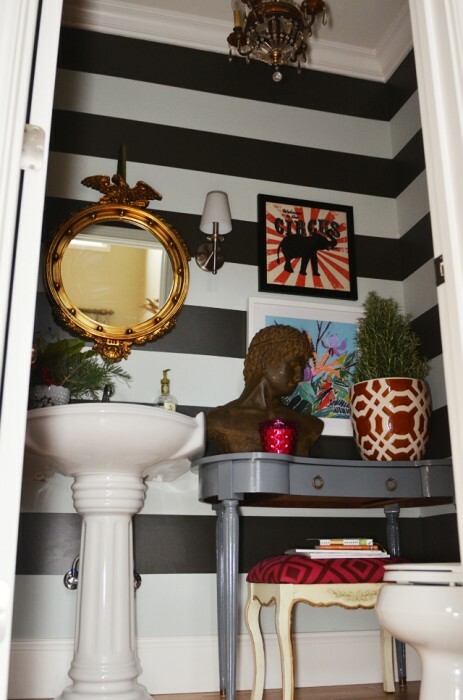 off to see Emily’s striped foyer…interested to know how the stripes flow into the rest of her house…. Hi, I love the sconces in your bathroom. I am thinking they would look great in my daughter’s room. Where did you get them? Thanks! Your blog is amazing! You are so creative. Love your home. New follower! Follow me back? 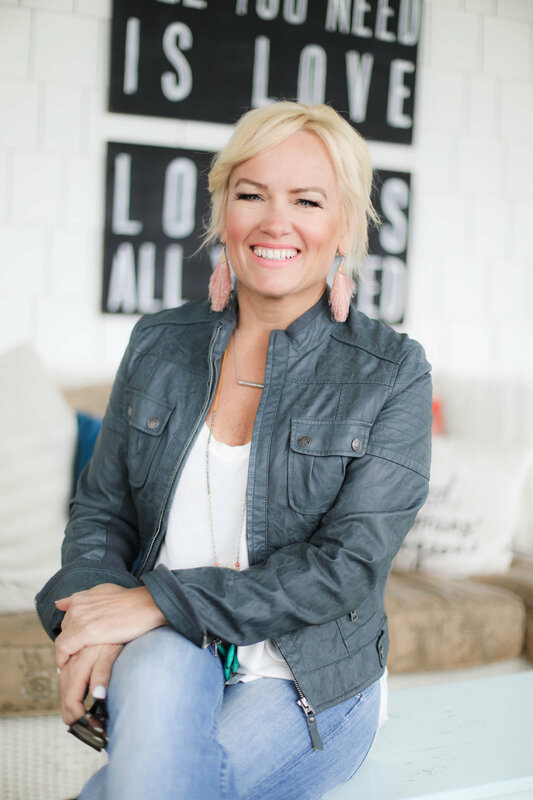 I LOVE LOVE LOOOOOVE your house, your style and your lovely heart!